A good tree can really make a garden, and magnolias are among the best for spring interest. Whether Cornish valley giants or diminutive shrubs, once in full flower these magnificent trees have the capacity to stop you in your tracks. 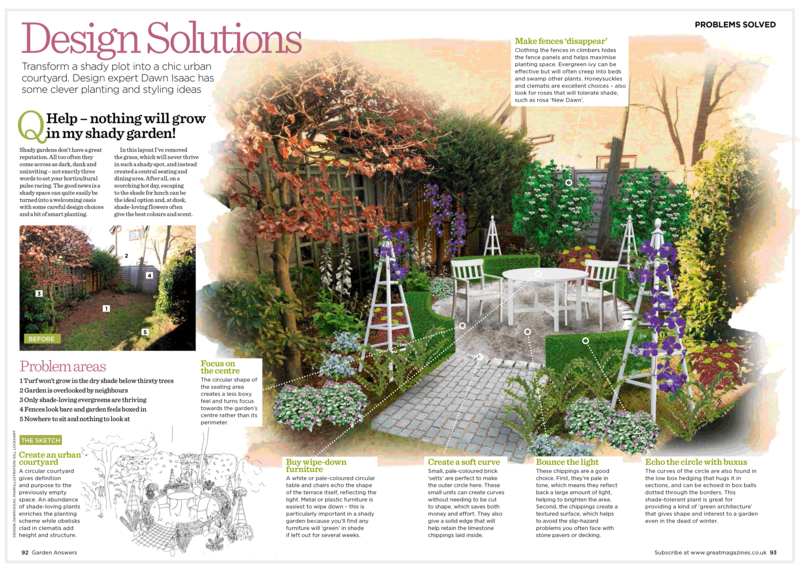 If you’re planting a tree as a key structural part of your garden, banish all ideas of pushing it to the boundary. 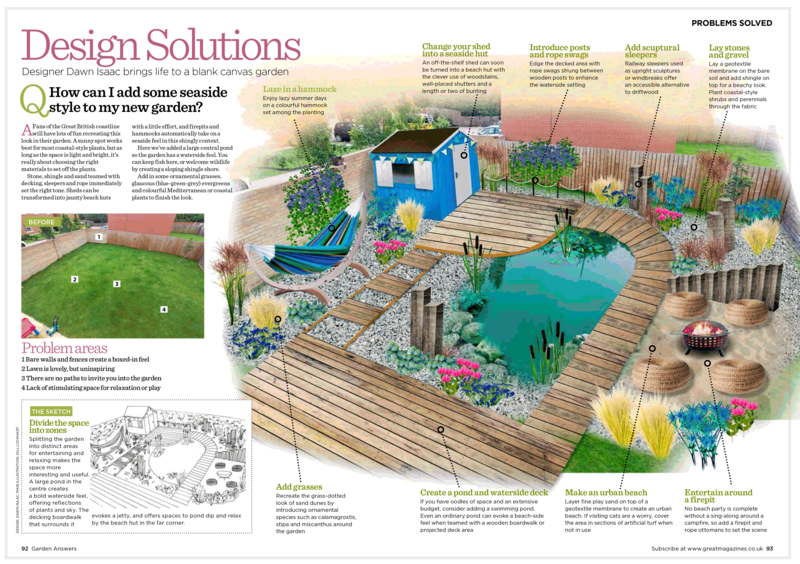 Such a feature deserves to stand at the very heart of your plot, and if you’re brave enough, you can banish the lawn altogether! To really set it off, surround it with a jewel-like collection of spring flowers including ravishing hellebores and luminous daffodils. Magnolias perform best in a sunny site that’s sheltered from chilly winds and frost. The plants are hardy but their flowers will suffer if affected by frost. For the best chance of avoiding late frost, gardeners living in more exposed areas would do well to pick a late-flowering cultivar; yellow-blossomed ones tend to flower in May. Winter isn’t generally a stop-you-in-your-tracks time of year in the garden, but a hamamelis that’s wrapped in scented, acid-yellow flowers will do just that. Even when the weather conspires against venturing out, a small sprig of these spidery explosions, cut and placed on a windowsill, is a delicious reminder that the garden lives on. It’s worth taking your time to find just the right place to create this winter scene – a place where you can truly celebrate the season rather than wish it away. Witch hazels prefer a sunny site and their flowers really glow when lit by a low sun, so make sure the plant won’t always be in winter shadow. You’ll also want to check that there’s enough room for its spreading, vase-shaped growth to develop unimpeded. They also like soil that’s on the acid to neutral side, but the crucial part is that it retains moisture over summer without becoming waterlogged in winter. 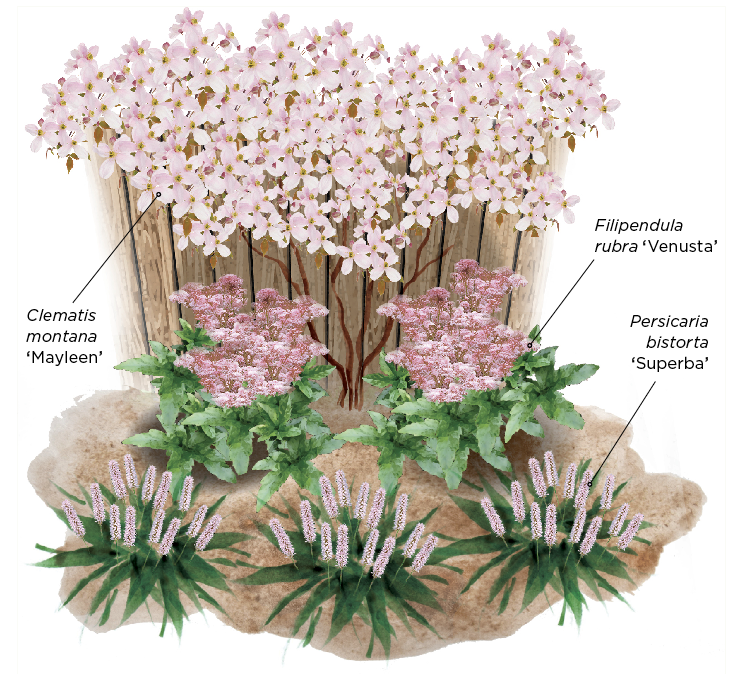 You could design a border where neighbouring plants have quieter supporting roles, such as an underplanting of bergenia with its rounded glossy leaves, or the dense, evergreen growth of sarcococca with its tiny, sweetly-scented blooms. This display, at The Bressingham Gardens in Norfolk, reveals the alternative, where colour has been ramped up with an underplanting of golden, striped acorus, rose-flowered winter heather, and a backdrop of fiery dogwood stems. This bright autumn border uses repetition with a twist. There are two cultivars of aster, several cornus and two miscanthus – a carefully thought through combination that unifies the planting yet allows plenty of variation in colour. It means that, despite the minimal plant diversity, there are enough contrasts of texture, structure and colour to make it really interesting. If you want to get the best from this planting you’ll need a sunny site. 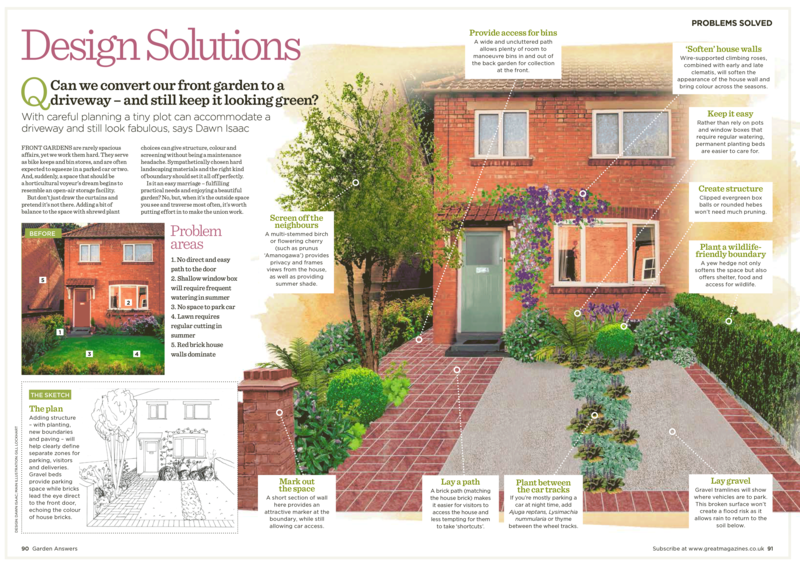 Not only will the plants grow best in full sun, but you’ll want them to catch the warm autumn sunlight to make their colours really pop. The asters in particular love sun to really thrive. tighter space then the dogwood ‘Midwinter Fire’ and purple aster ‘Violet Queen’ will make a striking combination on their own. Asters and acers are not the only plants to take on autumn colours. Certain grasses display a bonfire-like glow as the nights draw in and, if you choose carefully, they’ll continue to look good even as they slide into decay. This trio of grasses are a robust group that don’t need as much water over the summer months as some; a relief to those on free-draining soils. All have interesting flower heads once they mature so be sure to position them where late summer sunshine will pick up their graceful spires, and later their frosted seedheads. 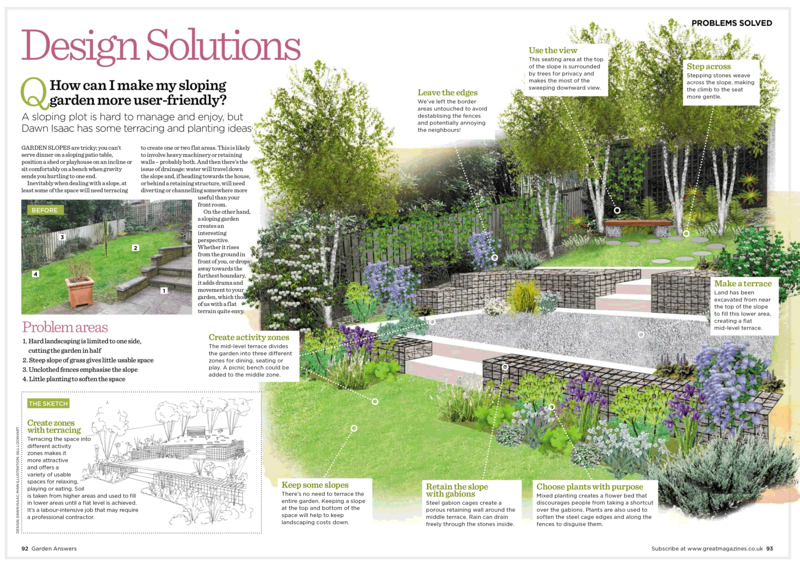 The planting will scale up well to larger areas, but you can also reduce it right back to a grouping of single plants, shown here. Intersperse them with perennials that retain interesting seedheads and you’ll add an extra dimension to the late autumn scene as well as earlier summer colour; try the dark bobbles of sanguisorba or slender spikes of Verbena hastata. Finally, position your grasses in a spot that’s sheltered from strong winds: you want their winter skeletons to stand for as long as possible. 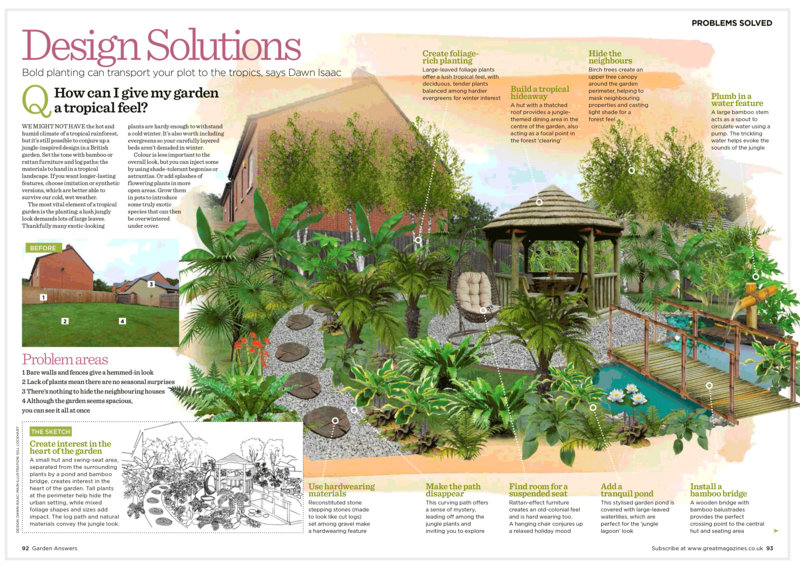 All the plants will benefit from a sunny site with a fertile soil that’s able to hold onto some moisture over summer, but which doesn’t become waterlogged in winter. Vivid hydrangeas, astilbes, eupatorium and echinacea can really raise the colour tempo. 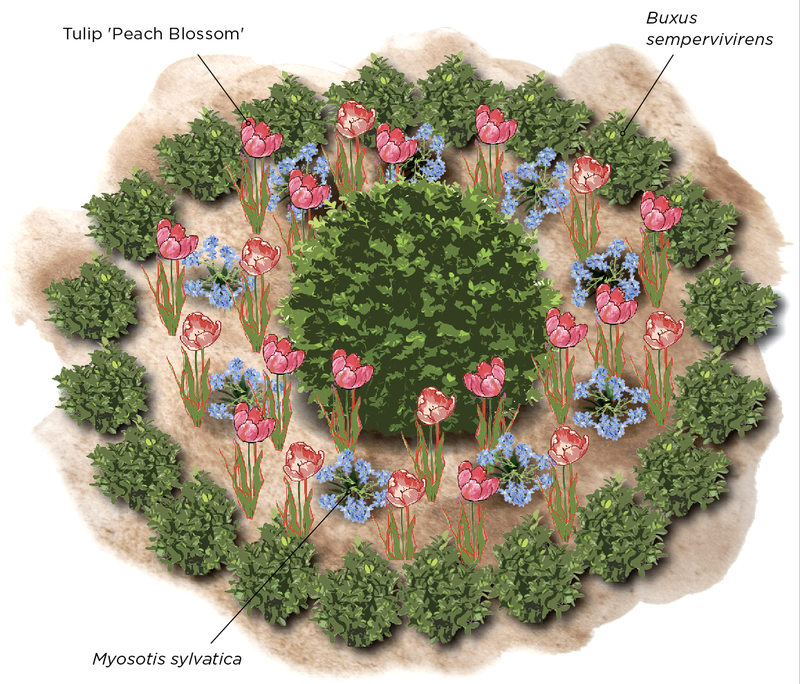 Here’s how to design and plant your own symphony in pink. At the heart of this July planting lies a colour harmony with just enough contrast in depths and degrees of pinks to keep things interesting. The hydrangea teetering into the realms of mauve is essential to prevent things becoming tame, but almost all the plants have a cool undertone. a strong repetition of flower shapes with gradients of colour. Striking mophead hydrangeas (Hydrangea macrophylla) carry your eye up and across the border, while the differing astilbes form the opposite diagonal. The dusky pinks will continue in the eupatorium just coming into bud at the back, while the pale pink wands of veronicastrums reinforce the astilbe’s verticals. Remember that flower colour of some mophead hydrangea cultivars varies according to your soil’s pH – acid soil gives violet or blue flowers and alkaline results in mauve, red or pink. Adding lime will help turn the soil more alkaline. All these plants will grow well on a soil that remains consistently moist – if you have sharply draining sandy soil, it would be best to find an alternative plant palette. Use double tulips in rosy pink! The winning combination of tulips and forget-me-nots (myosotis) is one of the happiest sights in spring. Here, they’re framed by interlocking circles and crosses of box hedging, surrounding a neatly clipped box ball. 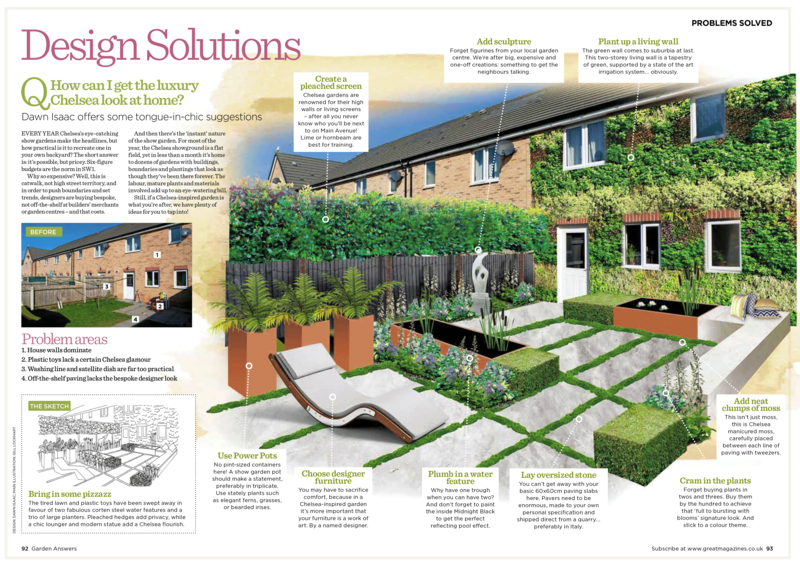 Fortunately, you don’t need a massive garden to create a similarly stylish effect. 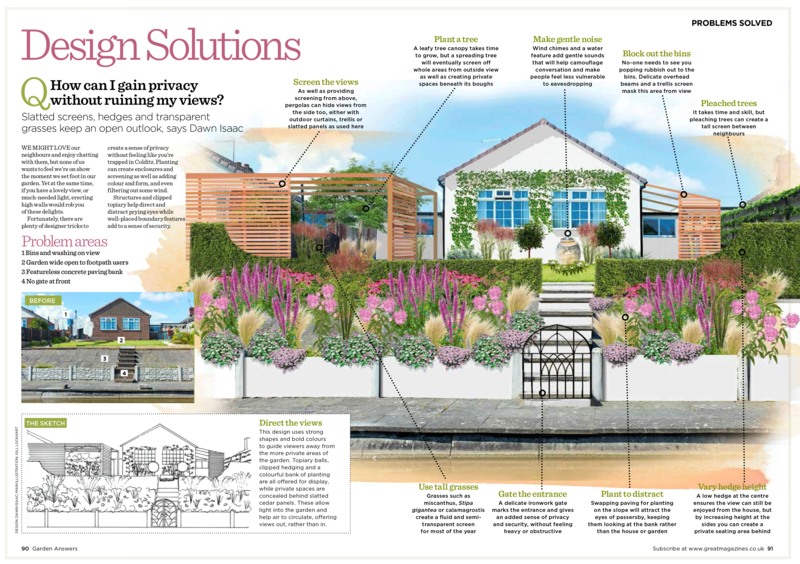 The scheme works because it’s very simple – just three plants. One is a soothing green evergreen, so the colour palette is restricted from the outset. The romantic effect of blowsy pink tulips floating above a sea of blue flowers is pure genius, but alternative colour schemes could work just as well: pink forget-me-nots with blue or mauve tulips and white forget-me-nots with blue or black tulips. It’s the tonal contrast that makes the scheme work; darker colours such as blacks, maroons and ruby reds may fail to stand out against the bold blue myosotis. Once you’ve picked your tulip colour, choose the shape – from simple goblets to frilly, more feathery-edged fancies. We’ve suggested a blowsy double tulip – these and peony or parrot-flowered tulips will bring a frisson of feminine ruffles and create a breathtaking focal point. The good news is that on a smaller scale, you won’t have to afford too many of them! Just bear in mind they won’t flower until later in the season than the simpler-shaped Triumph cultivars and Darwin hybrids, which also come in a much wider range of colours. This candy-coloured border looks every bit as delicious as the window of a sweet shop. It’s the perfect way to brighten up a shady corner of the garden, especially where conditions aren’t too dry. 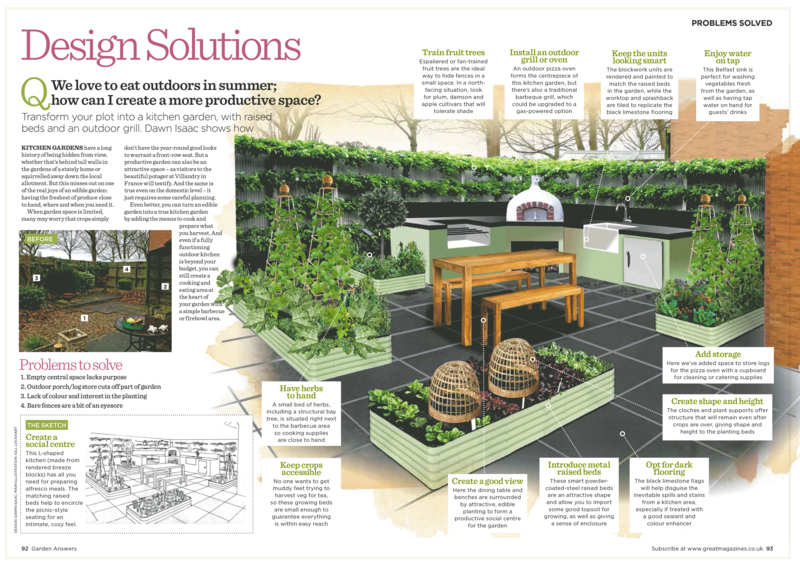 The flowers are arranged in layers to make the most of the space, with a cascades of pink clematis tumbling down at the back, pert drumsticks of persicaria popping up at the front and the lush green foliage of filipendula (with its feathery pink flowers later in the season) as a foil in the middle. Look more closely and you’ll see there are also pink aquilegia, tiny bells of Tellima grandiflora, a small deutzia, a peony and foliage of a pink-flowered Saponaria officinalis (soapwort) poised to flower later in the summer. Other good perennials to help embellish this perfect pastel border scheme might be pink lily-flowered tulips for spring, Japanese anemones for summer into early autumn, then pink asters to keep the colour coming right to the end of autumn. Nothing speaks of an English summer like a cluster of delphinium spires. They come in colours as varied as pure white and mulberry pink, but it’s the sought-after shades of blue that really add a magical shimmer. Pair them with a deeply scented pink rose and the white cloud-like flowers of giant sea kale (Crambe cordifolia) and you’ve the sort of midsummer planting combination we all dream of when winter’s dragging its heels. This trio of plants works so well thanks to their contrasting forms – the strong verticals of the delphiniums framed by the lightness of the white crambe flowers and open saucer shape of the roses. This contrast stops the planting becoming too fussy; even the large heart-shaped leaves of the crambe work to counterbalance its flowers. 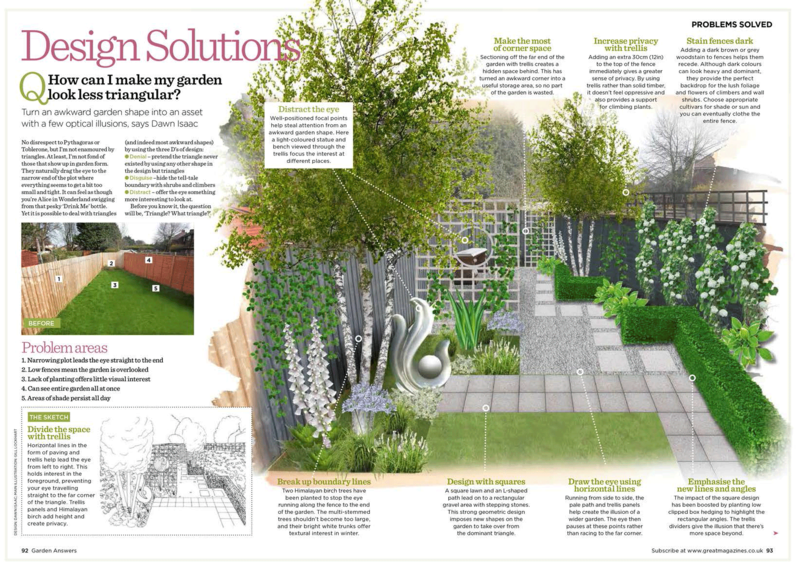 Although this will never be a scheme for a pocket-sized bed, it can be tweaked to suit a range of border depths. 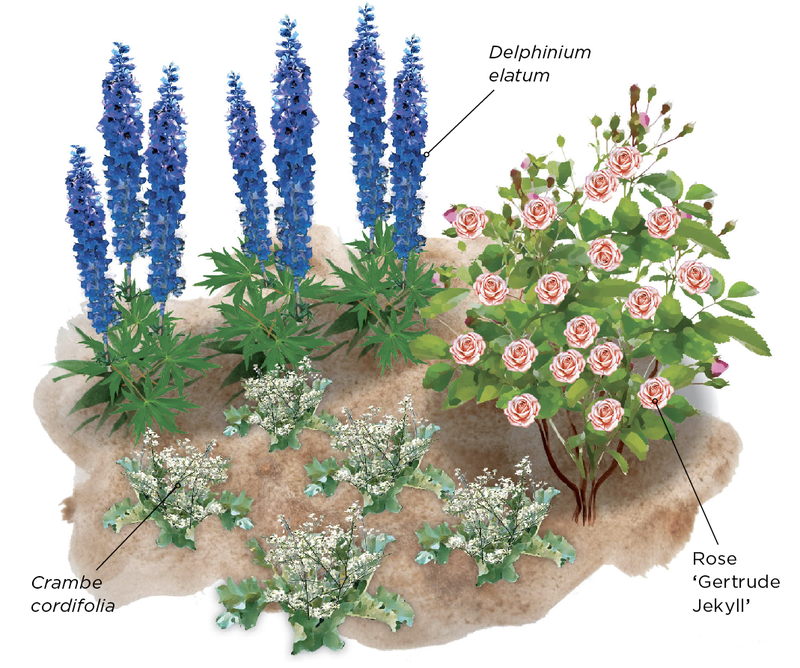 Delphinium cultivars hover around 1.2m (4ft) and up, but instead of the vigorous pink rambling rose ‘Albertine’ in this picture, you could choose an English rose such as the heavily scented ‘Gertrude Jekyll’. Not only can it be grown as a shrub or short climber but it’s repeat flowering for months of rich pink rosettes. 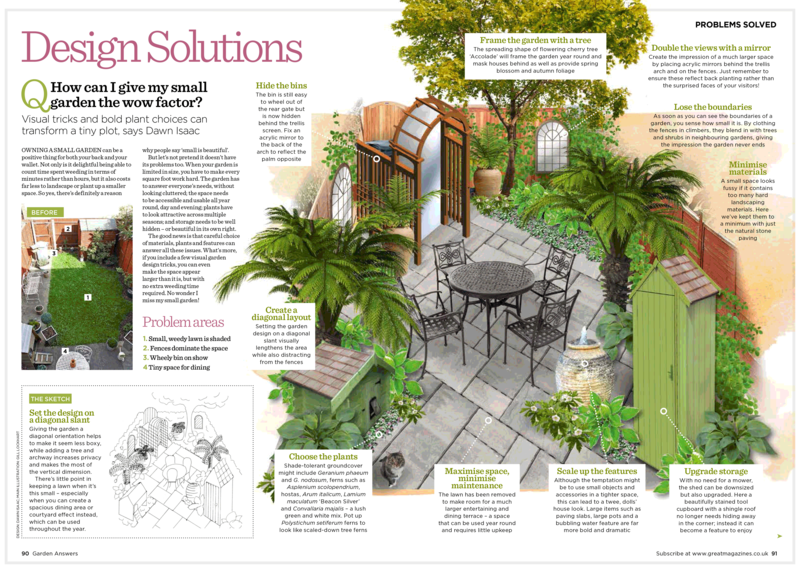 Saw article in new Modern Gardens mag…right up my garden path! Thank you! If your are an instagramer Im at gilllockhart!